Okay I wasn't a "blogger" when I was pregnant with Aiden so I just got the urge to post some of my Aiden belly pics! Little did I know what JOY I was in for when this little sweetheart was growing in my belly! i remember seeing those on facebook - and I LOVED them then and I LOVE them now. 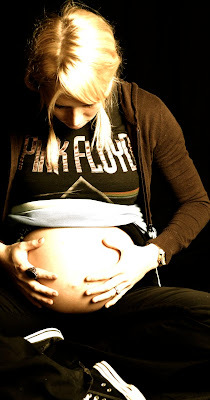 what cool pictures to have forever of sweet aiden in your belly :) hope everyone in the weigand family is better soon! love you! Such a cute pregnant momma!